My Cool Campervan is the sister publication to My Cool Caravan, which I reviewed in February. Like its sister volume, it is devoted to the joys of retro camping vehicles and the authors have made a real effort to unearth the unusual and exotic. This book is definitely not just another collection of classic VWs. Although a few (worthy) examples of classic VW campers are included, My Cool Campervan is all about unearthing the best, most unusual and most diverse examples of the genre, and its scope is surprisingly wide. For example, have you ever seen an early 1990s Skoda campervan? What about a one-off 1960s car-based Ginetta model? In total, 32 vintage campervans are pictured and described by their owners. A surprising number are British but the book also includes some European models, an Australian self-build and five classic American models, such as the ahead-of-its-time GMC Motorhome. Only one current model slips in, the demountable Tonke Camper, which qualifies by virtue of its novelty and its beautiful, traditional wooden construction, despite being brand new. 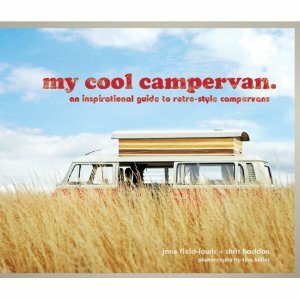 Like its predecessor, My Cool Campervan is beautifully photographed and attractively presented in hardback, making it an ideal coffee table book. I enjoyed it and was pleased by the genuine diversity the authors have managed to find. This is an enjoyable book that will be a good read for anyone who likes the campervan lifestyle and admires the ingenuity that goes into the design and construction of these treasured vehicles. ← Why Do Councils Ban Motorhome Parking?